Soft Cover, 224 pages, 6 x 9. 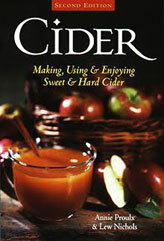 Discover the pleasure of making and drinking fresh cider with this complete, classic guide. Clear, simple language, numerous illustrations, and step-by-step instructions, lead you through making fresh and delicious sweet and hard ciders (including blended and sparkling ciders); building your own working apple press; enhancing your cooking with cider as an ingredient; choosing the right apple cultivar for the flavor you want; and planning and planting your very own home orchard for the freshest batch of cider ever! Plus, interesting bits of history and lore shed light on cider's colorful past.